Knitting for Patience - A Bridge Scarf, lead artist Tara Ulbrich and 250 knitters: Deloraine yarn-bombed like it's never been done before. Local alpacas and sheep have offered up their fleece, local craftsmen, women and children have dyed the fibres, and spinners have taken to the wheel... people have been seen knitting in doctor's waiting rooms, bedside in the hospital and in studios and delis about town. Our scarf will be a warm invitation to cross the bridge... clickety clack. 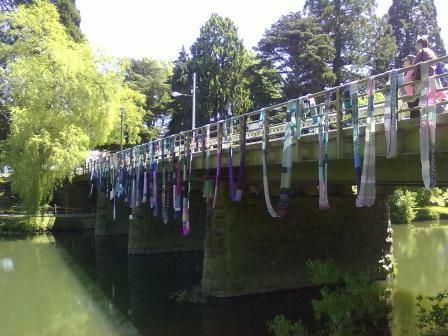 Tara Ulbrich: textile artist and radical homemaker collaborated with around 250 knitters to produce the 56m+ Bridge Scarf that will change each day on the town’s bridge from November 4-7.
and here is the photo...phenominal!!! WELL DONE Tara and Deloraine!!!!! Apologies to Latrobe - I didn't make it. But I did do Deloraine. We have two new makers! Beautiful!!! I missed the craft expo this year. This was a soft & sublime message to all the knitters & spinners in our community of Deloraine. A lovely project!